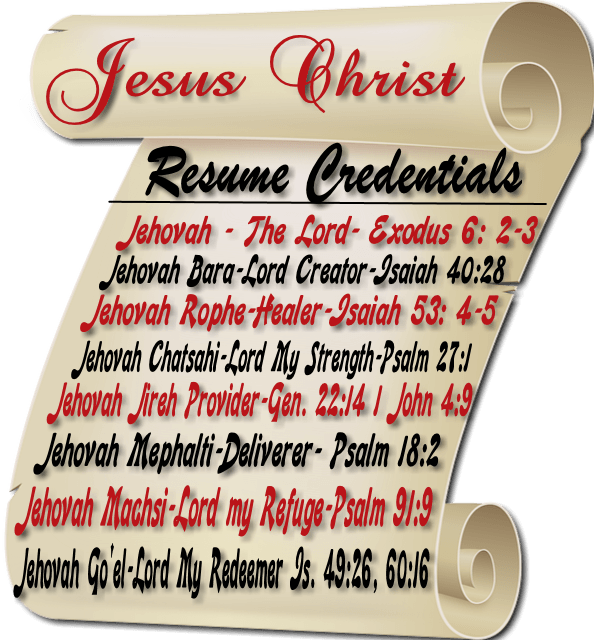 Obviously, this is not the real resume of Jesus Christ. Yet it is a representation of what it might have looked like. This is only meant to give honor to Jesus Christ for all that He has done for us in the past, in the present, and will do in the future for us! Here are some encouraging scriptures about Jesus Christ. People who listen to me shall dwell safely and shall not fear evil, (See Proverbs 1:33 ). I encompass the entire breadth and length of knowledge, wisdom, and understanding, (See Proverbs 2:6). There are many more major accomplishments, too many to mention here. You can read them on my website, which is located at www dot – the BIBLE. You don’t need an Internet connection or computer to access my website. Believers and followers worldwide will testify to my divine healing, salvation, deliverance, miracles, restoration, and supernatural guidance.